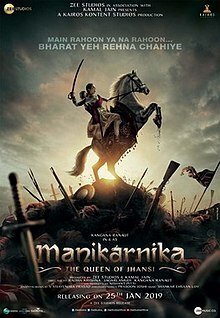 Manikarnika: The Queen of Jhansi is a 2019 Indian epic biographical period drama film based on the life of Rani Lakshmi Bai of Jhansi. It was directed by Radha Krishna Jagarlamudi, popularly known as Krish and actress Kangana Ranaut from a screenplay by K. V. Vijayendra Prasad and produced by Zee Studios, Kamal Jain, and Nishant Pitti. The film stars Ranaut in the title role. A special screening of the film was organized by Zee Entertainment for Ram Nath Kovind, the President of India, at Rashtrapati Bhavan, Cultural Centre on 18 January in presence of Kangana Ranaut and her team before release of the film on 25 January 2019. After watching the film the President felicitated the artists and crew of the film. A special screening of the film was organized by Zee Entertainment for Ram Nath Kovind, the President of India, at Rashtrapati Bhavan, Cultural Centre on 18 January in presence of Kangana Ranaut and her team before release of the film on 25 January 2019. After watching the film the President felicitated the artists and crew of the film. The film was released on 3700 screens in 50 countries worldwide in Hindi, Tamil and Telugu on January 25, 2019. The newly wed king and queen spend time together and develop a strong bond. Queen Lakshmi Bai learns and refutes the traditional womanly duties and takes a keen interest in learning about the political atmosphere of Jhansi and the state of the country instead. She is outraged as she discovers that her husband, the King of Jhansi, has to bow his head to a British officer, Gordon. She does not bow her head enraging Gordon. Jhalkari Bai’s calf 'Nandu' is abducted by some British officers prompting her to go after them only to get badly beaten up. When Lakshmi Bai learns about this cruelty, she confronts the officers speaking to them in fluent English to their surprise and announcing that all the livestock in Jhansi is the property of the king and will not be taken by the East India Company without permission. Lakshmi Bai returns Nandu and the two women develop a friendship. Amidst celebrations, Lakshmi Bai learns she is pregnant and is overjoyed. She gives birth to a boy, Damodar Rao. Sadashiv Rao is seen plotting against the king with the British officers who have promised him a part of the estate when Jhansi is conquered by the company. Sadashiv is briefly seen side-eyeing a maid to carry holy water to the naming ceremony of the baby, implying that he is behind the poisoning that eventually kills Damodar Rao and leaves the King weak and on his deathbed. To have an heir for the succession of the Jhansi throne, the King decides to adopt a child. Much to Sadashiv's dismay, his son is not adopted and instead, a civilian toddler that happens to run towards Lakshmi Bai is named the heir. His name is changed as Lakshmi Bai instinctively calls him Damodar. Sadashiv revolts and refuses to bow down to the future queen regent Lakshmi Bai and is banished from Jhansi. A few months later, when the King Gangadhar Rao dies, the East India Company expects to apply the Doctrine of Lapse and annex the kingdom of Jhansi as it does not have a male heir. Lakshmi Bai does not relent and refuses to accept the practices of widowhood of those times. Instead she takes on the responsibility of the throne in order to fulfill her promise to her late husband. When the British force her to vacate the palace, she walks gracefully into the village and is welcomed and greeted by a massive parade of villagers led by Jhalkari Bai. This further enrages the company officers. The queen continues to live among the civilians to quietly strategize to get her kingdom back. The company requests the British government to appoint Sir Hugh Rose to salvage the situation and remove Lakshmi Bai from the throne permanently. Knowing very well that she will soon be attacked again, Lakshmi Bai begins training her own army and especially women to fight. In the meanwhile, Sadashiv conjures a mutiny resulting in the deaths of many innocent British women and children in addition to British officers and blames it on Rani Lakshmi Bai to prompt Hugh Rose to attack and demolish her. On the way to Jhansi, Rose hangs a girl simply because her name is Lakshmi. During the siege of Jhansi, the Queen valiantly steps into the battle field to destroy the British cannons strategically placed in front of a temple. The strong castle walls keep the queen and her army safe until Sadashiv Rao divulges secrets about the castle to the British who finally break the siege and manage and attack, resulting in the death of Gaus-Baba. Jhalkari Bai, despite discovering that she is pregnant becomes a decoy pretending to be the queen. She manages to get all the British soldiers to follow her and distracts them enough for Lakshmi Bai to safely escape the castle with Damodar Rao. Jhalkari Bai sacrifices herself in a major gun powder explosion killing numerous British officers along with. Having lost everything but her love for the country, Lakshmi Bai escapes to Kalpi to reunite with Tantia Tope and other allies. She recaptures Gwalior and motivates the Maratha soldiers to participate in the independence war. With a heavy heart, Lakshmi Bai leaves Damodar Rao with her childhood friend and attendant, Kashi and leads an attack on the British army. Lakshmi Bai sets out to attack the huge British army but then faces a certain defeat. At the end of the film, Rani Lakshmi Bai looks at Hugh Rose and sets fire on herself to avoid being captured and killed by the British. Sukant Panigrahy, Sriram Iyengar and Sujeet Sawant are production designers of the film. Sujeet and Sriram have also done production designing for Bajirao Mastani . Principal photography was completed in October 2018. By that time, only 10 days of patch work remained. Krish intended to do that minimal patch work and then move on to direct N. T. R.. However, allegedly, Kangana insisted on removing Sonu Sood from the movie as she felt his strong screen presence would diminish her visibility. Sonu Sood was replaced by Mohammed Zeeshan Ayyub forcing the team to shoot all the scenes involving Sonu Sood all over again. Kangana made sure to direct those scenes herself, allegedly, to ensure her presence dominated in the movie. As Krish was busy in directing N. T. R., Ranaut took over, making her directorial debut. Both Krish and Ranaut received director's credit. The film's soundtrack is composed by Shankar-Ehsaan-Loy and lyrics written by Prasoon Joshi. The film's score was composed by Sanchit Balhara and Ankit Balhara. All lyrics written by Prasoon Joshi. All lyrics written by Chaitanya Prasad. All lyrics written by Madhan Karky. The first poster was released on 15 August 2018. A short official teaser of the film was released on 2 October 2018. The official trailer of the film was released on 18 December 2018. Theatrical posters of the film were released in two languages for simultaneous release of the film in Tamil and Telugu with Hindi version on 4 January 2019. Trailers of Manikarnika:The Queen Of Jhansi in Telugu & Tamil have been released simultaneously on 4 January at Hyderabad & Chennai. Manikarnika The Queen Of Jhansi Official Music Launch took place on 9 January. The Video Song from Manikarnika Titled as "Vijayi Bhava" was put out for public viewing on the same day. A jukebox of full film audio songs was released on YouTube on 11 January 2019. Short video teasers of dialogues and prominent scenes of the film were posted on facebook page of Zee Studios for viewers. The film is certified UA (Parental Guidance for children below the age of 12 years) by CBFC of India and the film is set to release on schedule. Its runtime is 148 minutes. The film released on 3700 screens in 50 countries worldwide in Hindi, Tamil and Telugu simultaneously. The film holds a score of 57% on Rotten Tomatoes based on seven critics reviews. Shibaji Roychoudhury of Times Now News rating the film 4 stars out of 5 gives his final thoughts as "Overall, Manikarnika has many moments of genius and enough fire to keep you glued to the screen. Kangana’s performance as Rani of Jhansi is worth every penny spent. So, if you are looking to feel patriotic this Republic Day and watch a visually stunning bit of cinema, go for this one with friends and family and you’ll have a great time at the theatres." Rating the movie 4 stars out of 5, Meena Iyer of DNA India praised the film saying "Kangana Ranaut infuses life into the braveheart queen. Kangana, who wears two hats that of the protagonist and the co-director displays a certain maturity on both counts." Iyer also mentioned that the performances by the supporting cast were brief yet noteworthy. She further added "The grandeur and the detailing of the war scenes lend the movie a storybook quality and one is quite mesmerised by the scale. KV Vijayendra Prasad, who wrote Baahubali, whips up an engaging screenplay. Prasoon Joshi has penned some fiery dialogue and lyrics with a patriotic fervour. Songs like Vijayi Bhava and Bharat stir up nationalistic emotions. The war sequences are tastefully choreographed by Hollywood imports Nick Powell and Todor Lazarov as well as desi action coordinators, Riyaz and Habib." Bolly Bazinga rated Manikarnika 3 stars out of 5, saying "This film belongs to Kangana Ranaut and she essays her character like no female character in the history of Bollywood. From script to screenplay, BGM, Cinematography and VFX, the film keeps you glued to your seat." The review further went on to say that it is a 'no nonsense' film and "loved it because it’s really the blood and soul of Kangana Ranaut we saw in every frame of the movie." Ronak Kotecha of The Times of India gave the film 3.5 out of 5 stars, saying that the film was one of Ranaut's best performances and that she "captivates your attention in every frame...Kangana effortlessly brings Manikarnika to life." However he noted that the supporting actors didn't get as much emphasis, and that the first half of the film seemed too long. The film had a grand feel but lacked the "required opulence and finesse." He commended the dialogues by Prasoon Joshi as being impactful, and the music strong; however he also noted that the length of the film seems to "slacken the narrative" at times. Finally, he states that Ranaut's debut directorial film and performance was a success, and keeps you invested throughout. Anita Ayer of the Khaleej Times also gave the film 3.5 out of 5 stars, saying that Ranaut's "grit and fierce act" does justice to her role, and that the film sensitively depicts the struggles of violence in the period. She commends the film for not "forcing feminism" on the viewer, but rather interweaving it with natural storytelling and incidents. Ankita Lokhande also gets a few scenes to shine in. The film is not as opulent visually, but the powerful dialogues, good screenplay and acting make up for it. The music by Shankar-Ehsaan-Loy is also strongly rousing and well-used near the finale. Taran Adarsh giving 3.5 stars out of 5 says in 'One Word Review: Manikarnika: POWERFUL' He continues stating "Inspiring movie that has scale and soul. Kangana, take a bow. You’re terrific. First half could be tighter. Second half awe inspiring. Climax brilliant. Power, pride, patriotism - this has it all. Anupama Chopra rated the movie 3 stars out of 5 saying "Kangana Ranaut is on fire as the iconic Rani Lakshmi Bai. Her spine is erect, her eyes are unblinking and she seems propelled by some other-worldly power. She’s riding horses, wielding swords, leaping on elephants and making it all look plausible. When she looks into camera and insists on dying for the country, you want to follow her into battle." She mentioned that the film wobbles because the screenplay does not give the supporting cast much opportunity to build their characters. She missed the subtlety in the dialogues and criticized the inept CGI work especially in the battle scenes and said at 2 hours and 28 minutes the movie is unforgivably long. Rahul Aijaz rated the film 3.5 out of 5 stars and wrote to The Express Tribune that the film "delivers on most fronts and proves an engaging affair from beginning to end." He praised Ranaut's acting as well as her role as a co-director, and noted that the film "is a one-woman-show". The digital distribution rights for the film were acquired by Amazon Prime Video for ₹40 crore and the satellite rights were purchased at ₹25 crore. The distribution rights for theater screening were purchased at ₹65 crore. The movie opened with ₹8.75 crore in domestic market. On its second day,which coincided with Republic Day holiday, the film collected ₹18.10 crore. On its third day the movie remained steady and collected ₹15.70 crore, taking its opening weekend domestic collection to ₹42.55 crore, making it the highest weekend collection for a female-led movie. Its domestic nett collection in opening week was ₹61.15 crore. The domestic gross of the film as per Bollywood Hungama is ₹117.18 crore and in the overseas market movie grossed ₹24.11 crore. The worldwide gross for the film is ₹141.29 crore (US$20 million). ↑ "Kangana Ranaut credited as director along with Radha Krishna Jagarlamudi– Times of India". The Times of India. Retrieved 2019-01-30. ↑ "It's official! Kangana Ranaut's 'Manikarnika' to clash with 'Super 30' early next year – Times of India". The Times of India. Retrieved 2018-07-21. 1 2 "Manikarnika: The Queen of Jhansi | British Board of Film Classification". www.bbfc.co.uk. Retrieved 2019-01-20. ↑ "Manikarnia: The Queen of Jhansi". Box Office India. Retrieved 8 February 2019. ↑ Gaikwad, Pramod (5 September 2018). "From Rs 60 crore to Rs 125 crore, Manikarnika's budget soars after Kangana Ranaut-Sonu Sood fued". International Business Times, India Edition. ↑ "Manikarnika - The Queen of Jhansi Box Office Collection till Now - Bollywood Hungama". Bollywood Hungama. Retrieved 23 February 2018. ↑ "Box office report: Manikarnika crosses Rs 100 cr mark in India, Uri collects Rs 225.5 cr". Hindustan Times. 18 February 2019. ↑ "Manikarnika Box Office: Kangana Ranaut's film roars at the ticket windows, enters Rs 100 crore club on 4th Sunday!". DNA. 18 February 2019. ↑ "More co-stars for Kangana Ranaut in Manikarnika: The Queen of Jhansi". Mumbai Mirror. ↑ "Manikarnika: Kangana Ranaut to share directorial credit With Krish?". timesnownews.com. 31 October 2018. ↑ "Kangana Ranaut's Manikarnika To Be Screened For President Kovind". NDTV. 17 January 2019. ↑ Taran Adarsh [@taran_adarsh] (18 January 2019). "Shri Ram Nath Kovind, President of India, watches #Manikarnika: The Queen Of Jhansi... The President felicitated the team after the screening. t.co/E3zN0gHPRC" (Tweet) – via Twitter. 1 2 Taran Adarsh [@taran_adarsh] (25 January 2019). "#Manikarnika: The Queen Of Jhansi screen count... India: 3000 Overseas: 700... releasing in over 50 countries Worldwide total: 3700 screens #Hindi #Tamil #Telugu" (Tweet) – via Twitter. ↑ The Editors of Encyclopaedia Britannica. "Hugh Henry Rose, Baron Strathnairn of Strathnairn and of Jhansi". Encyclopædia Britannica. Retrieved 4 February 2019. ↑ "Manikarnika The Queen Of Jhansi: Atul Kulkarni joins the Kangana Ranaut starrer as Tatya Tope". The Indian Express. ↑ Lohana, Avinash (17 April 2018). "Richard Keep: The man who takes on the Queen in Manikarnika". Mumbai Mirror. Retrieved 22 December 2018. ↑ "Suresh Oberoi to play Peshwa Bajirao II in Kangna Ranaut starrer Manikarnika". Bollywood Hungama. ↑ "Manikarnika The Queen of Jhansi: Ankita Lokhande joins Kangana Ranaut's army as Jhalkaribai". indianexpress.com. Retrieved 2017-07-28. ↑ "Mishti Chakraborty: I was initially hesitant to take up secondary characters". Mumbai Mirror. 17 December 2018. Retrieved 22 December 2018. ↑ "Taher Shabbir to play Sangram Singh in Kangana Ranaut's Manikarnika". Mumbai Mirror. Retrieved 2018-09-17. 1 2 Sengupta, Avipsha (18 December 2018). "Trailer: Kangana As The Epic Warrior Queen Is Sure To Give You Goosebumps". desimartini. Retrieved 21 December 2018. ↑ "It's a wrap for Kangana Ranaut's Manikarnika". Mid Day. 14 October 2018. Retrieved 14 October 2018. ↑ "'What Gave Her The Right to Tamper with What I Created?' Manikarnika co-director Krish Lashes out at Kangana Ranaut Again". www.masala.com. 28 January 2019. Retrieved 4 February 2019. 1 2 "Manikarnika Director Krish Finally Speaks Out On WHAT WENT WRONG Between Kangana Ranaut And Him". www.spotboye.com. January 30, 2019. ↑ "Mohammed Zeeshan Ayyub to replace Sonu Sood in Manikarnika!". Mid-day Mumbai. 1 January 2019. ↑ "Kangana Ranaut on Manikarnika, turning director, and why she's done playing the conventional heroine- Entertainment News, Firstpost". Firstpost. 19 December 2018. ↑ "కథే కథకుడిని ఎన్నుకుంటుంది". Sakshi. 13 January 2019. ↑ "Mohammed Zeeshan Ayyub to replace Sonu Sood in Manikarnika". mid-day. 1 September 2018. ↑ "Manikarnika: The Queen of Jhansi - Original Motion Picture Soundtrack". Saavn. ↑ "Manikarnika's first poster sees a fiery Kangana Ranaut charging at the enemy". The Indian Express. Retrieved 2 October 2018. ↑ "Manikarnika teaser: Kangana Ranaut looks fierce as Rani of Jhansi". The Indian Express. Retrieved 2 October 2018. ↑ "Manikarnika - The Queen Of Jhansi - Official Trailer - Kangana Ranaut". YouTube. ↑ Taran Adarsh [@taran_adarsh] (4 January 2019). "#Manikarnika - The Queen Of Jhansi will also be released in #Tamil and #Telugu on 25 Jan 2019... Posters: t.co/YwwQgSoAv2" (Tweet) – via Twitter. ↑ "Manikarnika Telugu trailer: Kangana Ranaut wins as fierce Rani Laxmibai. Watch video". Hindustan Times. 4 January 2019. ↑ "Manikarnika - The Queen Of Jhansi - Official Telugu Trailer - Kangana Ranaut". Zee Studio on YouTube. ↑ "Manikarnika - The Queen Of Jhansi - Official Tamil Trailer - Kangana Ranaut". Zee Studio on YouTube. ↑ "Vijai Bhava-Manikarnika - Kangana Ranaut - Shanker Ehsaan Loy - Prasoon Joshi". Zee Music Company on YouTube. ↑ "Manikarnika - Full Movie Audio Jukebox- Kangana Ranaut - Shanker Ehsaan Loy - Prasoon Joshi". Zee Music Company on YouTube. ↑ "Her motive was to serve one and all, that is what defined the future of India! Zee Studios". 17 January 2019. ↑ Taran Adarsh [@taran_adarsh] (20 January 2019). "#Manikarnika: The Queen Of Jhansi certified UA by Indian censors #CBFC on 16 Jan 2019. Approved run time: 148 minutes [2 hours, 28 minutes]... #India" (Tweet) – via Twitter. ↑ Taran Adarsh [@taran_adarsh] (23 January 2019). "#Manikarnika: The Queen Of Jhansi to release in over 50 countries worldwide in #Hindi, #Tamil and #Telugu... 25 Jan 2019 release. t.co/9xNhUHZ4Yz" (Tweet) – via Twitter. ↑ "MANIKARNIKA: THE QUEEN OF JHANSI". Rotten Tomatoes. Retrieved 29 January 2019. ↑ "Manikarnika movie review: Kangana Ranaut's war epic has many moments of genius | Entertainment News". www.timesnownews.com. ↑ "Manikarnika movie review: Kangana Ranaut delivers a performance par excellence in this realistic story of the warrior princess Lakshmibai - Bollywoodlife.com". www.bollywoodlife.com. 24 January 2019. ↑ "'Manikarnika: The Queen Of Jhansi' Review - Kangana Ranaut infuses life into the braveheart queen". dna. 24 January 2019. ↑ Buzzinga, Bolly (24 January 2019). "#Manikarnika REVIEW: O-U-T-S-T-A-N-D-I-N-G (4 STARS ) This film belongs to #KanganaRanaut and she essays her character like no female character in the history of Bollywood. From script to screnplay, BGM, Cinematography and VFX, the film keeps you glued to your seat(1/2)pic.twitter.com/3NQcWuz2N0". 1 2 Iyer, Anita. "'Manikarnika' review: Kangana Ranaut emerges true hero in this war drama". Khaleej Times. Retrieved 2019-01-24. ↑ Taran Adarsh [@taran_adarsh] (24 January 2019). "#OneWordReview…#Manikarnika: POWERFUL. Rating: ⭐️⭐️⭐️½ Inspiring movie that has scale and soul... Kangana, take a bow. You're terrific... First half could be tighter. Second half awe inspiring... Climax brilliant... Power, pride, patriotism - this has it all. #ManikarnikaReview t.co/MLRnjBewws" (Tweet) – via Twitter. ↑ "Anupama Chopra's Movie Review of Manikarnika: The Queen of Jhansi | Kangana Ranaut" – via YouTube. ↑ Joshi, Namrata (25 January 2019). "'Manikarnika: The Queen of Jhansi' review: playing patriot games" – via www.thehindu.com. ↑ Rahul Aijaz (26 January 2019). "Manikarnika: A one-woman show". The Express Tribune. Retrieved 30 January 2019. ↑ Khan, Salman (29 January 2019). "कंगना रनौत की मणिकर्णिका- रिलीज के साथ ही कमाया बंपर प्रॉफिट". hindi.filmibeat.com. ↑ adarsh, taran (31 January 2019). "#Manikarnika scores in Week 1... Had excellent weekend [#RepublicDay holiday] and healthy trending on weekdays... Weekend 2 crucial... Fri 8.75 cr, Sat 18.10 cr, Sun 15.70 cr, Mon 5.10 cr, Tue 4.75 cr, Wed 4.50 cr, Thu 4.25 cr. Total: ₹ 61.15 cr. India biz. #Hindi #Tamil #Telugu". ↑ "Bollywood Top Grossers Worldwide". Bollywood Hungama. 4 February 2019. Retrieved 23 February 2019. ↑ "Manikarnika – The Queen Of Jhansi Film Collection: Check out Manikarnika – The Queen Of Jhansi Box office collection till now". Bollywood Hungama. Retrieved 23 February 2019.